This article describes a Guanella balun suitable for HF multiband dipoles fed with open wire line and an ATU at the transmitter. generous power rating given our 400W PEP limit. The balun is nominally 1:1, but perfection in impedance transformation is not a priority for the application. It is difficult to obtain high common mode impedance, high voltage withstand and low VSWR, difficult and not necessary when the balun will be used with an ATU. 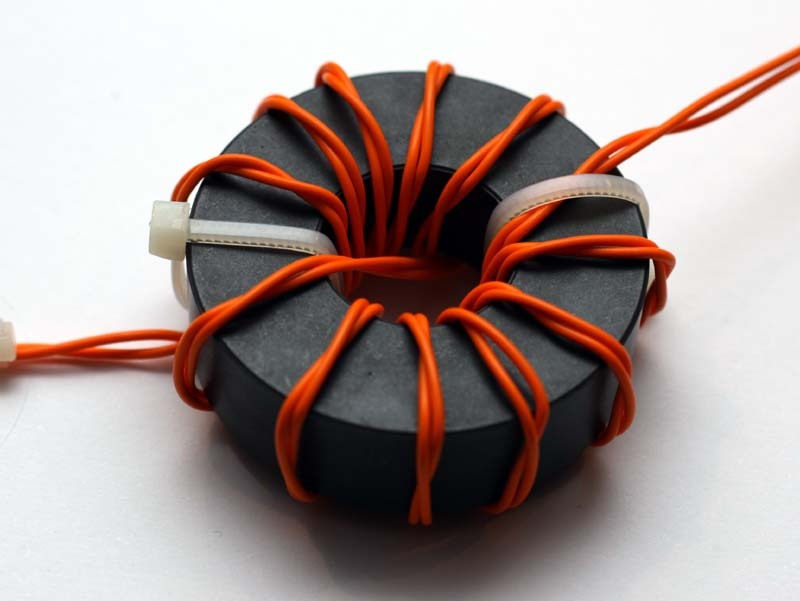 The core is a 63x27x19mm toroid of Nickel Manganese Ferrite material with µi approximately 220. The design uses Neosid F14 material, but K material and Fair-rite #52 material are similar, and could be substituted. Note that this core is larger than the popular FT240 core (61×35.5×12.7mm) and this design and the predicted performance is not directly applicable to the smaller cores. 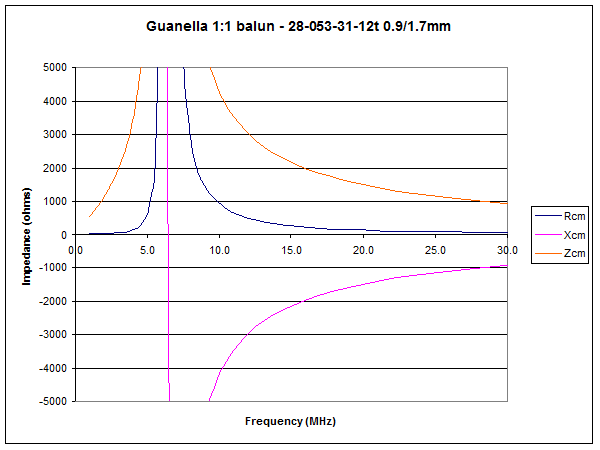 A model consistent with A model of a practical Guanella 1:1 balun was created using published core data. A prototype was constructed and the common mode impedance measured. The model was calibrated with 6pF of shunt capacitance so that the first resonance was at 6.5Mhz as per characteristics measured of the prototype. Calibrated modelled characteristics are set out in Table 1. The choke was wound in the crossover style for convenience in making connections to the choke. Above is modelled Zcm over HF. Quantity Zcm is the magnitude of Rcm+jXcm. Above is the prototype balun. The core is wound in cross over style with a twisted pair of 0.8mm (#20) Teflon insulated silver plated stranded copper conductors. Almost all of the loss in a current balun is due to common mode current, and is highly dependent on the antenna system scenario. The copper and dielectric loss in this design is less than 0.1dB. The Neosid 28-053-31 core is readily available in Australia direct from Neosid, and at reasonable prices. Cores for two baluns and express post (to Australia) will probably cost around $35. The teflon insulated silver plated stranded copper conductor was obtained on Ebay. On test, the wire withstands a Hipot test at 5kV RMS, so 7kV pk. The Neosid 28-053-31 core provides an excellent basis for a Guanella balun suitable for HF multiband dipoles fed with open wire line and an ATU at the transmitter. The balun has high to very high choking impedance from 80m to 10m, and choking impedance on 160m that may be adequate for many purposes. The balun is based on a large core with high Curie temperature, so should have sufficient dissipation capacity suit power levels well beyond the Australian 400W PEP limit. My recommendation is to house the balun in a plastic box, external to the ATU. This minimises stray capacitance, helping to preserve high end performance.